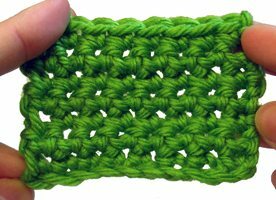 Early on in the writing of this blog I put together a series of How To posts for the basic crochet stitches, so I thought that today I’d aggregate those all in one space here for people who want them. Below you will find written instructions, images, video tutorials, links and more for the sc, hdc, dc and tr. Enjoy! One of the most basic things that you learn when you first start learning how to crochet is how to single crochet. When looking at crochet patterns, the crochet abbreviation for single crochet is (sc). Crochet the length of foundation chain that you want to use. Turn the piece so that you are ready to start your single crochet. Insert the crochet hook into the second chain away from the hook. There will be two loops on the chain at this point. Pull the yarn through both of these loops. Turn your piece so that you are ready to begin your next row of single crochet. Chain one before doing anything else. This is your turning chain. Insert the hook into the first stitch of the row (the single crochet that is immediately next to the turning chain you’ve just created). Pull through both loops on the chain.